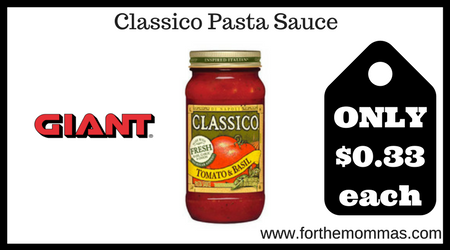 Giant: Classico Pasta Sauce ONLY $0.33 Each Starting 12/7! This nice deal is back again. Starting Friday 12/7, Giant will have Classico Pasta Sauce on sale for just $2.00 each and these are included in the buy 6, get $0.40 off gas rewards offer. We currently do not have any coupons for this product but we can maximize the gas rewards points and we can pick up Classico Pasta Sauce for just $0.33 each. Good time to stock up!